A workshop developed and presented by Gulland Associates Inc. 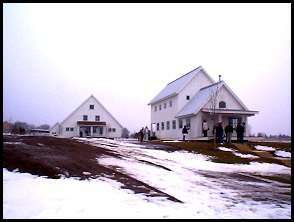 This is a view of the front of House #1 and the back of House #2. They face on different streets but their closeness made course logistics convenient. House #1 at about 1800 sq. ft. was considerably smaller than House #2 which was about 3500 sq. ft. 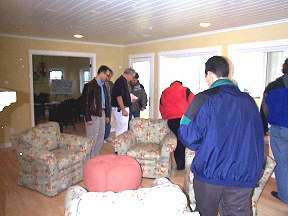 Course participants check out house #1. The fact that the wood stove chimney penetrates the building envelope slightly below the highest heated space was reflected in its tendency to cold backdraft at low levels of depressurization. 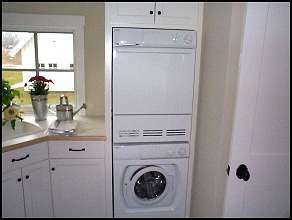 This is the utility room of House #1, showing the HRV (top left), furnace with outdoor combustion air duct (center), clothes dryer and power vented water heater. 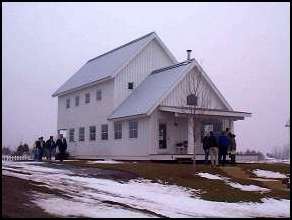 Course participants conducting the pressure test on House #1. 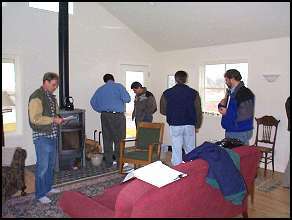 The closed controlled combustion wood stove has a depressurization limit of 7 Pa. Here is the manometer set up with its hose tucked out through the door gasket. The two fellows at the front door in the photo above are taking a reading from it. 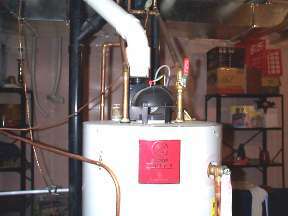 The power vented water heaters in both houses were significant exhaust devices. The black inverted cup-shaped draft hood is visible in front of the exhaust fan. Although these water heaters are not as spillage susceptible as conventional water heaters, their high demand for air can create problems for chimney vented stoves and fireplaces. 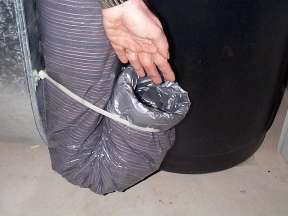 The HVAC contractor had dutifully installed this trap (elephant's trunk, Saskatoon loop, other names have been used) in the combustion air duct. The premise behind this idea is that since cold air "falls down" such air inlets because it is heavy, it pools at the base of the loop and prevents flow until an exhaust fan creates an air demand. But cold air doesn't fall down ducts or chimneys because it is heavy, it is sucked down by stack effect or fan depressurization. Therefore, this duct flowed air even when all fans in the house were off because house stack effect demanded it (air flows to zones of lower pressure). John Crouch in front of House #2 on Friday, which was unfortunately too windy for testing, as you can see by his flapping coat. 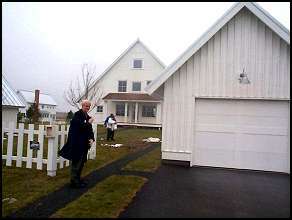 Behind him are Karen Teske-Osborne of NCHPA and Peter Solac who made the arrangements for us to use these houses. 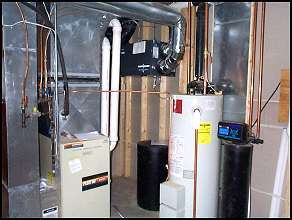 This is the utility room of House #2, showing the sealed combustion furnace (left), HRV (center) and power vented water heater. 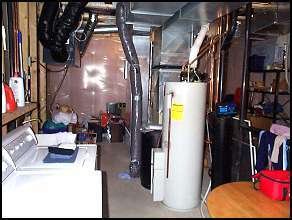 The equipment and materials used are similar for both houses because the same builder and HVAC contractor was used. 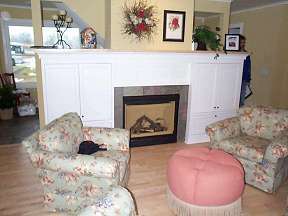 Here is the DV gas fireplace. As it turned out, this house could have had a woodburning fireplace without violating the Energy Code's maximum depressurization limits. Although this clothes dryer made a lot of noise, it flowed almost no air because of a long and convoluted duct. It would be a nightmare to clean and will probably result in a call-back to the builder. 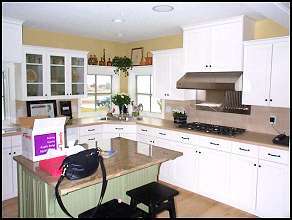 This view of the kitchen shows the overhead range exhaust. It was noisy, but didn't move much more air than the principal bathroom exhaust. Here are the three optional manometers and the house test report form. 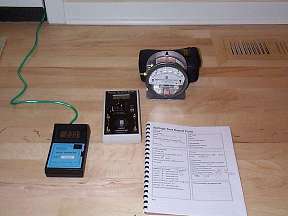 Of the two digital manometers on the left, the center one was favored because it had an internal averaging capability which reduced wind-induced fluctuations. 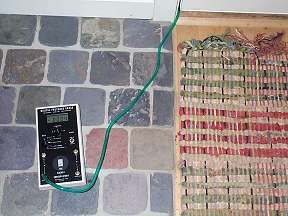 The magnehelic gauge on the right was not found as effective, although it is much cheaper. No, these people are not inspecting each other's shoes, they are watching the manometer readings as fans are turned on and off. 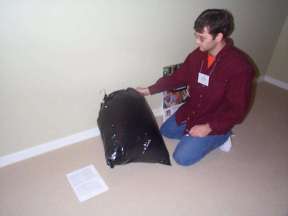 Here is the calibrated garbage bag in action, measuring flow from a heating supply register. Course participants found this simple tool a useful addition to their diagnostic arsenal. The maximum allowable depressurization was 7 Pa for the wood stove, so this house easily complied with the Energy Code without additional make-up air. The maximum allowable depressurization was 25 Pa for the DV gas fireplace and power vented water heater and sealed furnace, so this house easily complied with the Energy Code without additional make-up air. In fact, the gas fireplace could have been swapped for a conventional wood fireplace and still met the code without make-up air.